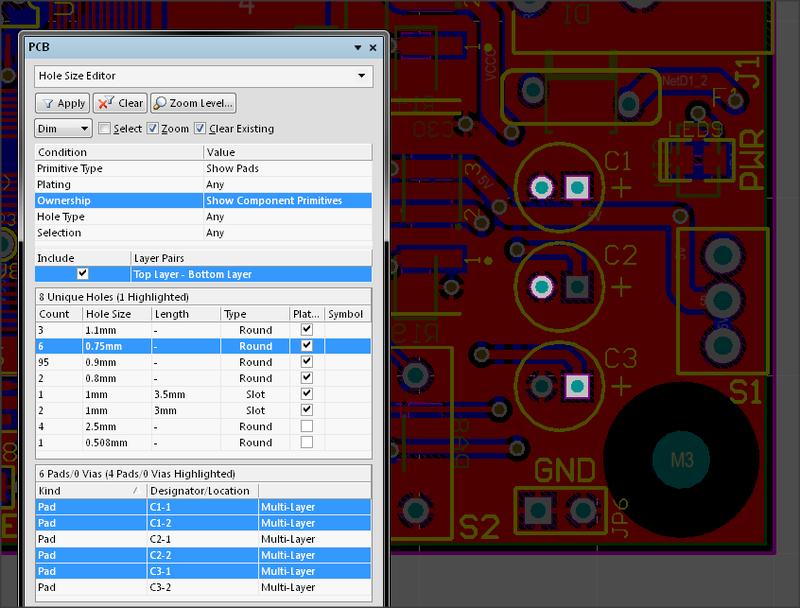 The PCB panel gives you full acces to board objects, items and classes via a filtered browser. The PCB panel allows you to browse the current PCB design using various filter modes to determine which object types or design elements are listed, highlighted or selected. 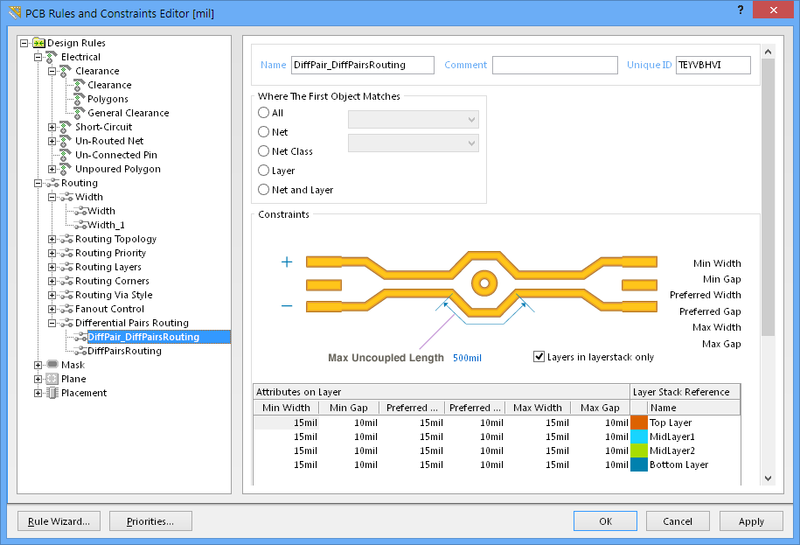 It also has editing modes for certain object types or design elements that provide you with specific controls on the panel for editing procedures. Note, you can access the properties for any element listed in this panel. To open the PCB panel click the View | PCB | button, or use its secondary button and the associated drop-down menu to open the PCB panel in a particular browsing mode. Panels can be configured to be floating in the editor space or docked to sides of the screen. If the PCB panel is currently in the group of docked Workspace panels on the left, use the PCB tab located at the bottom of the panels to bring it to the front. If already open and docked in the Workspace panels, use the PCB tab to access the PCB panel. The top drop-down list in the panel is where you select the panel mode. The mode can be set to browse nets, components, polygons, or set to use the Split-Plane or Hole Size Editors. Select the browsing mode using the top pull-down list. In any of the modes, as you click on an entry in a subsequent region of the panel a filter is applied, essentially using the entry as its scope. The visual result of the applied filtering on the document in the design editor window is determined by a series of highlighting controls toward the top of the panel. The effect that is imposed in the editor view can be set to Normal, Mask or Dim, where in practice, Mask has the most obvious highlighting effect. Normal - Filtered objects are visible in the design editor window and the appearance of unfiltered objects remains unchanged. Dim - Filtered objects are highlighted in the design editor window, with all other objects retaining their colors, but shaded. In Mask view mode, unfiltered (not selected) objects are monochrome. To set the contrast of the background (un-highlighted) objects, use the Mask Level slider control available in the Highlight & Edit Mask group under the View tab. Similarly, in Dim view mode unfiltered objects retain their colors, but are shaded. Set the balance between filtered and unfiltered objects using the Dim Level slider available in the Highlight & Edit Mask group under the View tab, as shown above. Use the button to remove the display highlighting. Select - when enabled, the filtered objects will be selected in the workspace. Zoom - when enabled (default), the filtered objects will be zoomed and centered (where possible) in the design editor window. Use the button to adjust the zoom factor that will be used to close-in on filtered objects. Clear Existing - when enabled (default), any existing filter will be cleared before applying a new one. Disabling this option allows you to extend an existing filter, essentially refining the filter further by applying a new filter in addition to the existing one. The bottom section of the PCB panel provides a mini-viewer for the current document, with an image of the current board design central to its window. A white viewing box is imposed on the image to show the area currently displayed in the design editor window. As the editor display automatically pans and zooms in response to the PCB panel filter selections, the box moves and expands accordingly to indicate the board viewing area. The mini-viewer automatically window pans and zooms to reflect the status of the main editor window. As you manually pan around the document in the design editor window, – using the editor's horizontal and vertical scrollbars or the right-click panning hand – the viewing box in the panel will also move accordingly. Conversely, if you click inside the viewing box and drag it around the board image, the document in the design editor window will be panned accordingly, and at the current zoom level. As you zoom in or out in the design editor window, the viewing box will be resized accordingly in the panel. Conversely, resizing the viewing box in the panel, by clicking and dragging on any of its vertices, will cause the zoom level to change in the design editor window. The smaller the size of the viewing box, the more the actual document has been zoomed-in. Net Classes, as defined by the board. 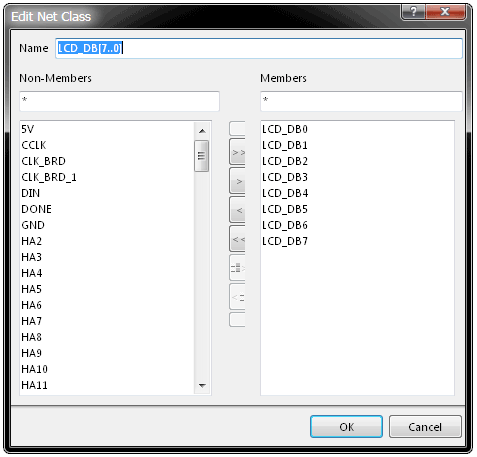 Individual member Nets within a class. Individual items within a Net (pads, vias, tracks and fills). The PCB panel regions allow a cumulative filter selection through net classes, to individual nets, to net items (primitives). Right-clicking on a net or net item entry and choosing the Properties command from the associated context menu (or double-clicking on the entry directly) will provide access to the relevant properties dialog, from where you can view or modify the properties of the net/item as required. Right-clicking on a net class entry and choosing Properties from the menu (or double-clicking on the entry directly) will open the Edit Net Class dialog for that class. From this dialog you can view/modify the net membership of the class, rename it, or add additional classes. Editing a selected net class. The display/inclusion of each net item type, in the Net Items region of the panel, is dependent on whether the corresponding option for each has been enabled on the right-click menu, accessed from either the Nets or Net Items regions. Right-click on a net or net item entry to select the included items. In summary, as you click on an entry in the panel's list, a filter will be applied based on that entry. The visual result of the selection (in the design editor window) is determined by the highlighting methods enabled (Mask/Dim/Normal, Select, Zoom). Multiple entries can be selected in each region, using standard Shift+click and Ctrl+click methods. A net class LED[7..0] selected with the visual mode set to Mask. Individual primitives that constitute a Component (pads, tracks and arcs). The PCB panel regions allow a cumulative filter selection through component classes, to individual components, to component primitives. Right-clicking on a component or component primitive entry and choosing the Properties command from the associated context menu (or double-clicking on the entry directly) will provide access to the relevant properties dialog, from where you can view/modify the properties of the component/primitive as required. Right-clicking on a component class entry and choosing Properties from the menu (or double-clicking on the entry directly) will open the Edit Component Class dialog for that class. From this dialog you can view/modify the component membership of the class, rename it, or add additional classes. Editing a selected component class. The display/inclusion of each component primitive type, in the Component Primitives region of the panel, is dependent on whether the corresponding option for each has been enabled on the right-click menu, accessed from either the Components or Component Primitives regions. Right-click on a component or component primitive entry to select what items are included. Three components are selected from the U_SL_Config component class, with the visual mode set to Mask. Place the panel in Split Plane Editor mode by selecting Split Plane Editor from the drop-down list at the top of the panel. The Nets/Layers section of the panel will fill with all internal plane layers currently defined for the design. Within that section, the Split Count column indicates how many split planes exist for the corresponding plane layer. A split count of 1 effectively means that the layer has not been split, and the layer itself is considered to be a single split. Internal planes layers are added to the design's layer stack in the Layer Stack Manager dialog; Home | Board | . Note that the name of an internal plane layer is defined in the Layer Stack Manager dialog. As you click on an entry in the Layers section, all of the split planes on that plane layer and their assigned nets will be loaded into the Split Planes area of the panel. To view only nets associated with split planes in this section, ensure that the Show Split Plane Nets Only option is enabled on the right-click menu. For each entry, a Node Count is displayed. This value reflects the total number of pads and vias that are connected to that split plane region. Filtering will be applied based on the entry chosen in the Layers section, the visual result of which (in the design editor window) is determined by the highlighting methods enabled (Mask/Dim/Normal, Select, Zoom). Multiple entries can be selected using standard Shift+click and Ctrl+click methods. As you click on an entry in the Split Planes section of the panel, filtering will be applied based on that entry. Again, the filtering results depend on the highlighting methods enabled and whether pads and/or vias are enabled with respect to their visibility. Multiple entries can be selected in the region. Here, the VCC layer has a 3V3 and 5V0 region split. The selected 5V0 split is visible as the highlighted region (and vias) on the right. Note: With the Mask option enabled (as above), you will be able to see all split plane regions for a chosen plane layer more easily, provided that the plane layer has been enabled with respect to its visibility in the design workspace (from the View Configurations dialog). To also include the pads and/or vias associated with each split plane net for the layer, ensure that the corresponding options (Show Pads and Show Vias respectively) are enabled on the right-click menu, when accessed from either the Split Planes or Pads/Vias On Split Plane sections of the panel. Double-click on an entry to bring up the Split Plane dialog, from where you can change the net to which the split plane region is connected. Choose from any of the currently loaded nets for the design. 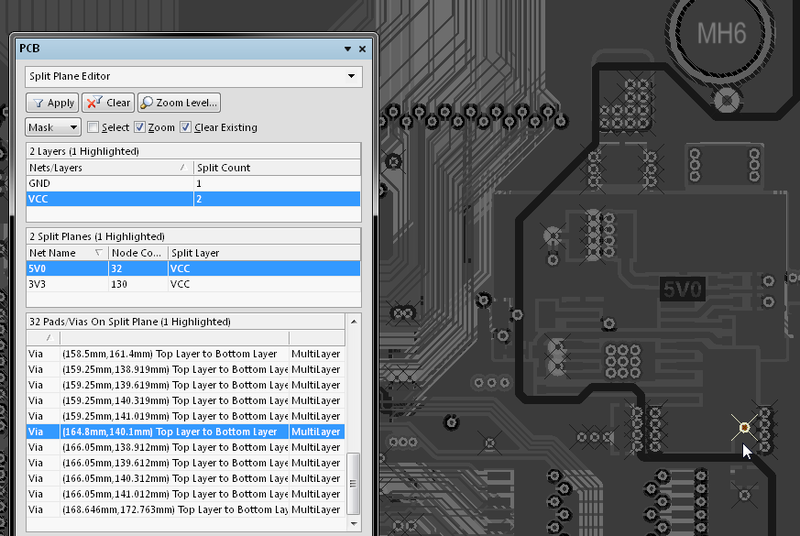 The Pads/Vias On Split Plane section of the panel lists each of the pads and/or vias connecting to the split plane region selected in the Split Planes section. Entries will only appear if the corresponding Show Pads and/or Show Vias options have been enabled from the right-click menu. As you click on a pad or via entry, filtering will be applied based on that entry. With masking applied, the selected pad/via entry will be highlighted in the editor workspace.. If you wish to see where a pad or via resides in relation to the split plane region, click on that region within the design workspace before clicking a pad/via entry. Again, multiple entries can be chosen from the list. A selected Via can be seen highlighted in the board's 5V0 split plane region (shown near the mouse arrow). The VCC Layer has been selected as the editor view. In the panel's Pads/Vias On Split Plane section, right-clicking on a pad or via entry and choosing the Properties command will open the relevant properties dialog, from where you can view/modify the properties of the pad/via as required. Right-click a Via/Pad in the list and select Properties to open the Via/Pad Properties dialog. Individual member differential pairs within a class. The constituent nets (negative and positive) that form a differential pair. A selected differential pair, as a member of the 'Ethernet' class, displayed with highlighted set to Dim. As you click on an entry in a list, a filter will be applied based on that entry, the visual result of which (in the design editor window) is determined by the highlighting methods enabled (Mask/Dim/Normal, Select, Zoom). In this way you can quickly highlight all differential pairs in a particular Class, a particular Differential Pair, or a particular Net that forms the negative or positive half of a differential pair. Multiple entries can be selected in each region, using standard Shift + click and Ctrl + click features. 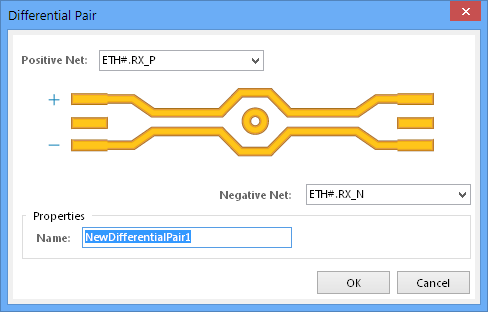 In the panel's Differential Pairs section, clicking the button, right-clicking on a entry and selecting Properties, or simply double-clicking on a differential pair entry will provide access to the Differential Pair dialog, from where you can view/modify the properties for its differential pair Name and its constituent Nets. See the following Managing Differential Pairs section for more on the Differential Pair dialog. Right-clicking on a entry in the PCB panel's Nets section and selecting Properties (or double-clicking on the entry directly) will provide access to the Edit Net dialog, from where you can view/modify the properties of the net as required. Differential Pairs are normally defined in the project's Schematic by appropriate net labels (with a _P and _N suffix, or equivalent) and added Differential Pair Directives, prior to the PCB update process – see Home | Circuit Elements | Directives in the Schematic editor. Use the Differential Pairs region of the PCB panel to manage the differential pair objects in a design. For the particular differential pair class selected, all currently defined differential pair objects that belong to that class will be listed in this region – the All Differential Pairs option will include all differential pairs, regardless of their class membership. Use the buttons at the bottom of this region to create new differential pair objects, or edit or delete existing ones. These three commands are also available from the right-click menu for the region. When adding a new differential pair (with the button), the Differential Pair dialog will open. Use the dialog to define the pair object, in terms of a positive and negative net and a meaningful name. By default, the name will be set to NewDifferentialPair1 and the positive and negative nets will be set to the first and second available nets in the netlist for the design. Use the drop-down lists to select from the available nets. Note that only available nets are listed for selection. Nets currently defined as part of existing differential pairs are not listed. When editing an existing differential pair object, the Differential Pair dialog will again appear, with the currently chosen nets for the pair entered into the Positive Net and Negative Net dropdown fields respectively. Change one or both nets for the pair, or rename the pair, as required. Differential pair objects can be automatically created from the nets in your design using the Create Differential Pairs From Nets dialog. This dialog is accessed by clicking on the button at the bottom of the Nets region of the PCB panel. Prospective differential pair objects are listed for creation in response to the filter entries at the top of the dialog. The effectiveness of this automated method directly depends on the naming convention that has been used for the specific nets that will make up the differential pairs. Ideally, a naming convention will be used whereby a common root is followed by a consistent positive/negative indicator (_P and _N), or high/low indicator (_H and _L). For example, consider the Ethernet receiver signal pair D_ETH#.RX (see above), which is a differential signal in the design. 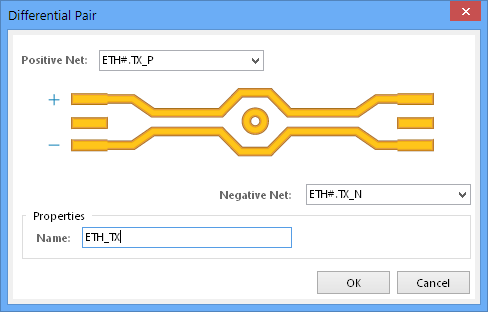 The two nets that constitute this signal are ETH#.RX_P and ETH#.RX_N - these represent the positive and negative sides of the signal, respectively. The filters at the top of the dialog enable you to quickly target these nets in terms of the net class to which they might belong, and the particular differentiating factor that has been used to distinguish the positive and negative nets in an intended pairing – for example, _P and _N. You can also define a prefix to be added to the differential pair objects created, and also determine in which differential pair class they are to be added. In the above example, notice that the name for a differential pair object is created using the prefix specified and the root of the differential pair signal. The polarity indicators are discarded. For each differential pair object, the dialog lists its constituent positive and negative nets. By default, all prospective differential pair objects are selected for creation, and individual ones can be excluded by clearing the associated Create check box. In the example above, both filtered nets checked for creation. When all options are set as required, click the Execute button - the differential pair objects will be created and the PCB panel will update accordingly. Filtering will be applied to show the created pairs in the workspace, as shown below. Differential pair objects created from nets. In practice, differential pairs would normally be defined before the nets are routed. The preferred Gap between the network pair, and its permitted range. The maximum Uncoupled Length (the pair is uncoupled when the gap is wider than the maximum Gap setting). The preferred routing Width for each net. The optional gap/width setting variations for each layer in the stack. The scope (in terms of associated objects) for the rule's application. 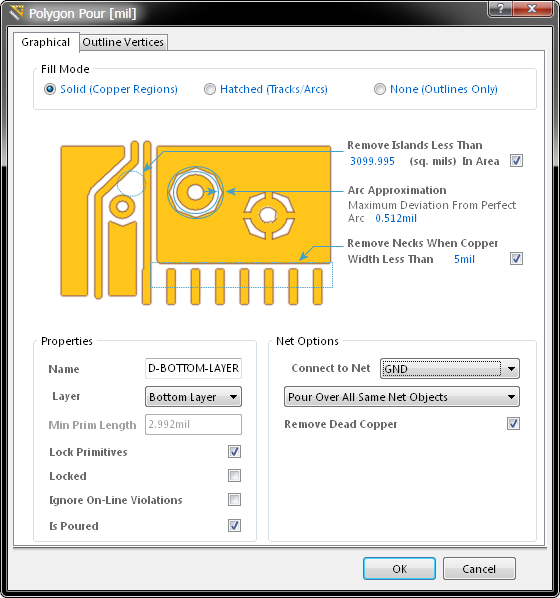 While rules can be created manually using the PCB Rules and Constraints Editor (Home | Design Rules | Design Rules), the PCB panel offers the convenience of the Differential Pair Rule Wizard. 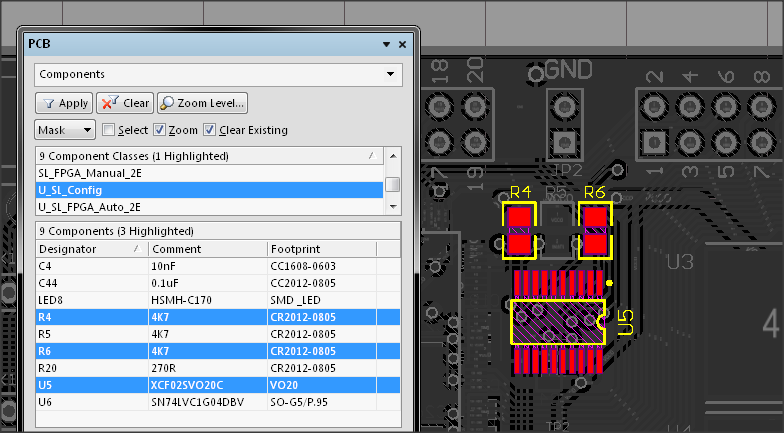 Use the button (below the Nets region in the PCB panel) to access the Wizard and implement the rule properties as required. The Differential Pair Rule Wizard guides you through the rule definition process. The Wizard allows you manage the priority of associated clearance rules, such as those defined for Polygon and general objects. The clearance from a net in a differential pair to any other electrical object (that is not a part of the pair) is monitored by the applicable Clearance rule. 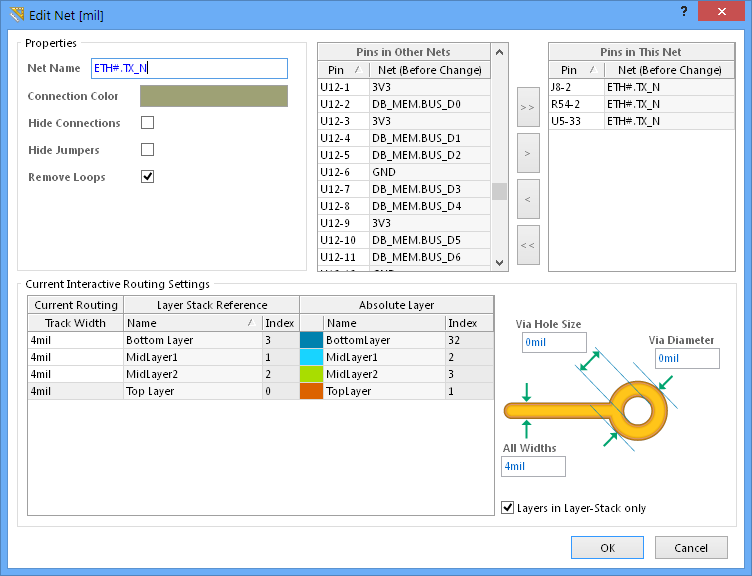 In the newly defined Differential Pair rule, the min/max/preferred Width and Gap settings will apply to all layers, or can be individually set for each layer in the wizard dialog's Attributes on Layer area. 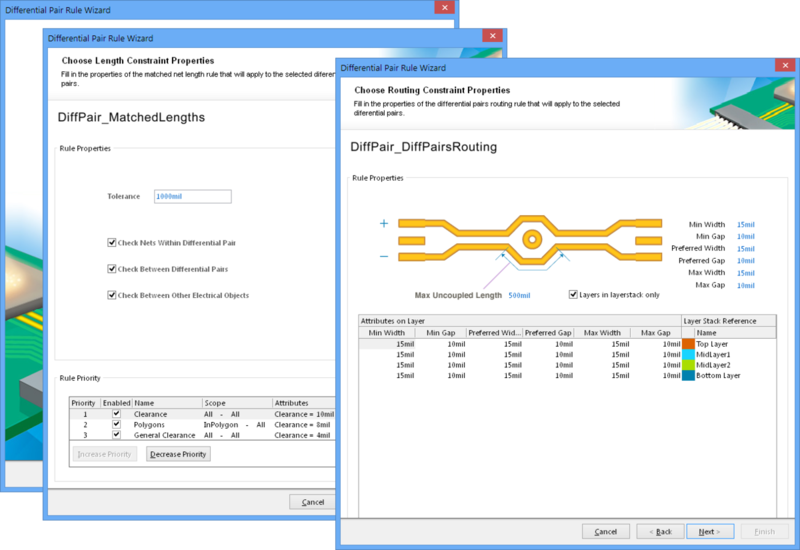 To edit the configuration of an existing Differential Pairs Routing rule, including how it applies to Layers or Nets (its scope), open the PCB Rules and Constraints Editor dialog (Home | Design Rules | Design Rules from the main ribbon menu) and navigate to Routing - Differential Pairs Routing. For a differential pair the Gap and Width settings can either be set for all layers, or they can be set for each layer in the grid region below the differential pair graphic. Individual Polygons within a class. Individual primitives that constitute a Polygon (tracks, arcs and regions). For full control and editing of Polygon Classes, open the Object Class Explorer dialog; Home | Design Rules | . From this dialog you can view/modify the polygon membership of the class, rename it, or add additional classes. 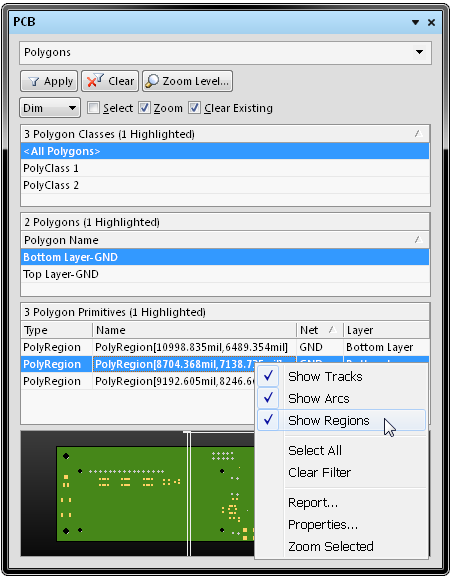 In the PCB panel, right-clicking on a polygon entry and selecting Properties (or double-clicking on the entry directly) will open the Polygon Pour dialog, from where you can view/modify the Polygon properties as required. Similarly, right-clicking on a polygon primitive entry and selecting Properties (or double-clicking on the entry directly) will provide access to the relevant properties dialog, such as the Regions dialog, from where you can view/modify the properties of the primitive as required. In the PCB panel's Polygon Primitives region, the display/inclusion of each polygon primitive type is dependent on the setting of corresponding enabling option, accessed from right-click menu. 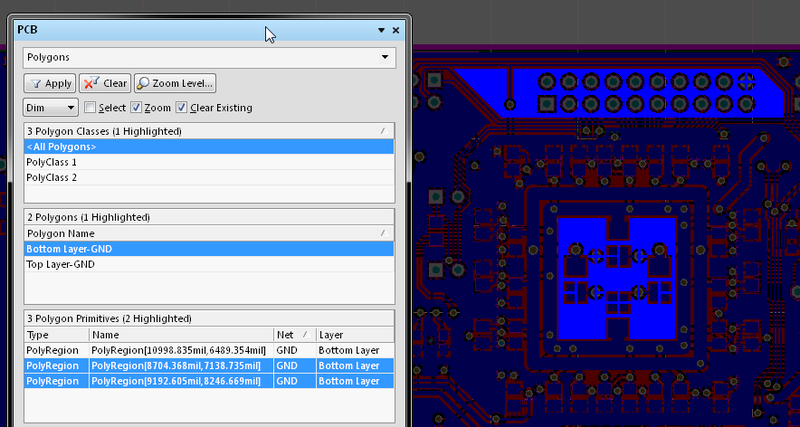 As you click on an entry in the PCB panel's list a filter will be applied based on that entry, where the visual result of which (in the design editor window) is determined by the enabled highlighting methods (Mask/Dim/Normal, Select, Zoom). Multiple entries can be selected in each region, using standard Shift+click and Ctrl+click methods. Polygons are formed by multiple primitives such as tracks, arcs and regions. 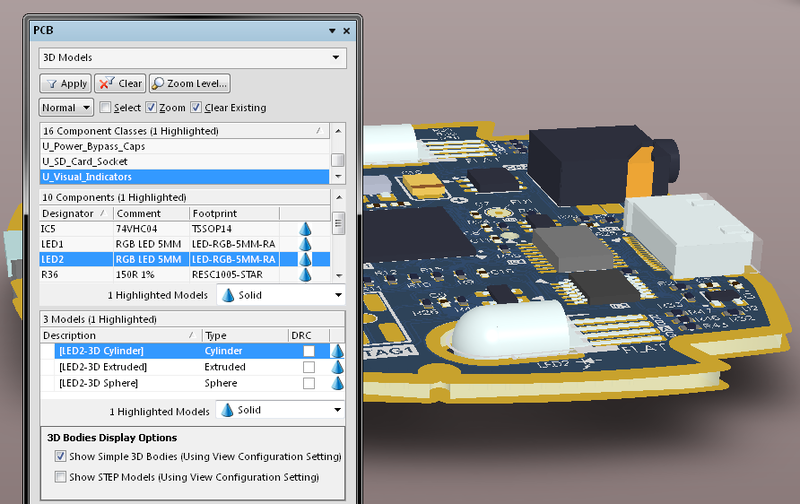 Two regions are selected above, and the PCB view set to Dim. The general filtering for hole types and their status. Hole objects arranged in groups, as determined by size and shape. Individual primitives that constitute each group of hole objects (pads, vias and slots). The three panel sections show the cumulative filtering applied to hole types, styles and status. The groups of holes can be collectively edited in the Unique Holes section of the panel by entering values in the appropriate column cell. 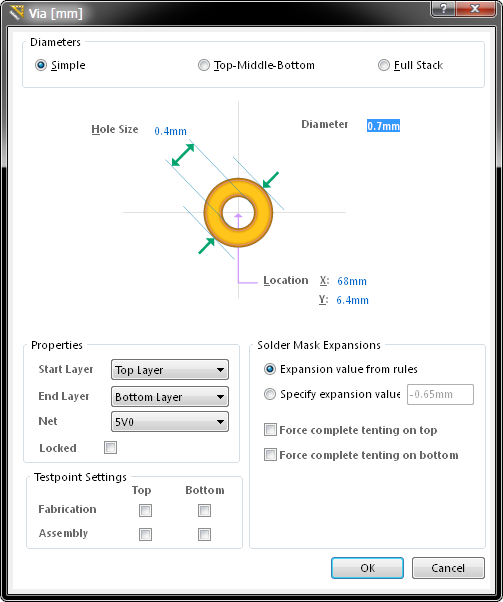 You can enter a value in mm to change the current hole size for pads and vias in the Hole Size column. Editing the hole size for the selected group of six matching hole styles. You can also change the corresponding Length, Type and Plated entries for holes where applicable. Changing the hole type (from round to square) for the selected group of six matching hole styles. Individual pad/via objects belonging to the selected holes group are listed in the lower Pad/Via section of the PCB panel. Right-clicking on an object in the list and selecting Properties (or double-clicking on the entry directly) will open the matching dialog for that primitive, where its properties can be viewed and edited. As you click on an entry in the PCB panel's lists a cumulative filter will be applied based on that entry. The visual result of this (in the design editor window) is determined by the highlighting methods enabled (Mask/Dim/Normal, Select, Zoom). In this way you can quickly highlight all holes of a particular status, holes of a particular style or size, or an individual hole primitive (pad/via) that exits in that filtered group. Multiple entries can be selected in each list section, using standard Shift+click and Ctrl+click methods. The panel selections filter down to hole primitives of a specific type. Four are selected and displayed here from the '0.75mm & Round' group, as selected above. 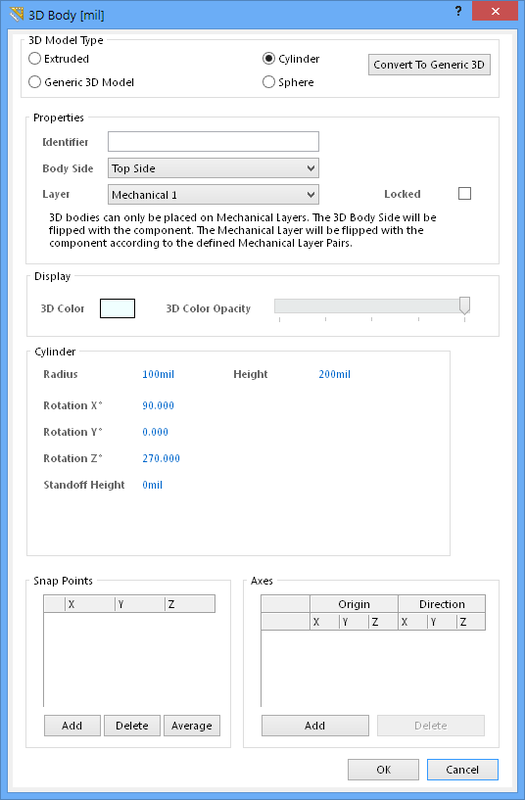 Place the PCB panel in 3D Models mode by selecting 3D Models from the drop-down list at the top of the panel. Change to 3D viewing mode through the View » Switch to 3D menu, or use the '3' shortcut. Specific components associated with the component class that have associated 3D body object(s) or free models (non-PCB mounted, free-floating 3D bodies). The individual 3D bodies for each component or free model. 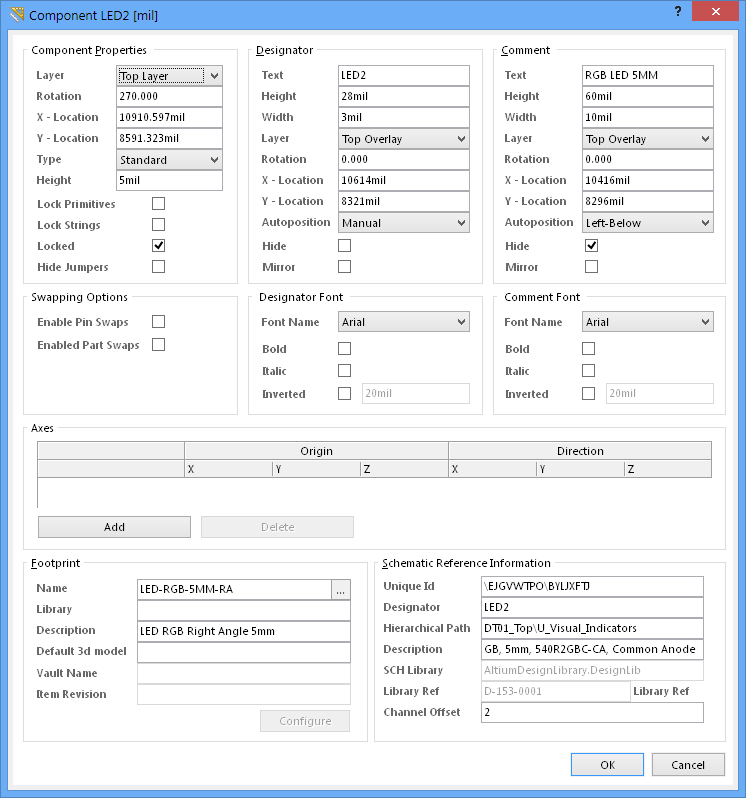 The PCB panel's filter scope progresses through component classes to components and their constituent model elements, while the visual result tracks the changes. As you click on a specific component in the Components region of the panel, filtering will be applied using the component as the scope of the filter. The visual result (in the design editor window) is determined by the highlighting methods enabled (Mask/Dim/Normal, Select, Zoom). Multiple entries can be selected using standard Shift + click and Ctrl + click features. Double-clicking a component entry in the Component region of the panel (or right-clicking and choosing Properties) will open the relevant Component dialog, from where you can edit its properties in detail. Similarly, double-clicking a model entry in the Models region of the panel (or right-clicking and choosing Properties) will open the relevant 3D Body dialog, from where you can edit the complete 3D body properties. 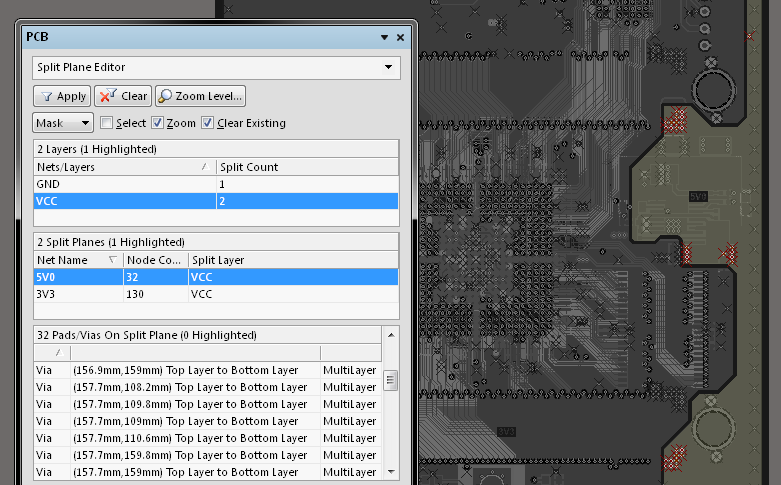 When selecting a component's constituent models from the Models list area in the PCB panel, the view in the editor workspace will zoom, dim/mask or select accordingly. An individual model selected from a component. In this case, a cylinder from a LED component in the board's U_Visual_Indicators class. 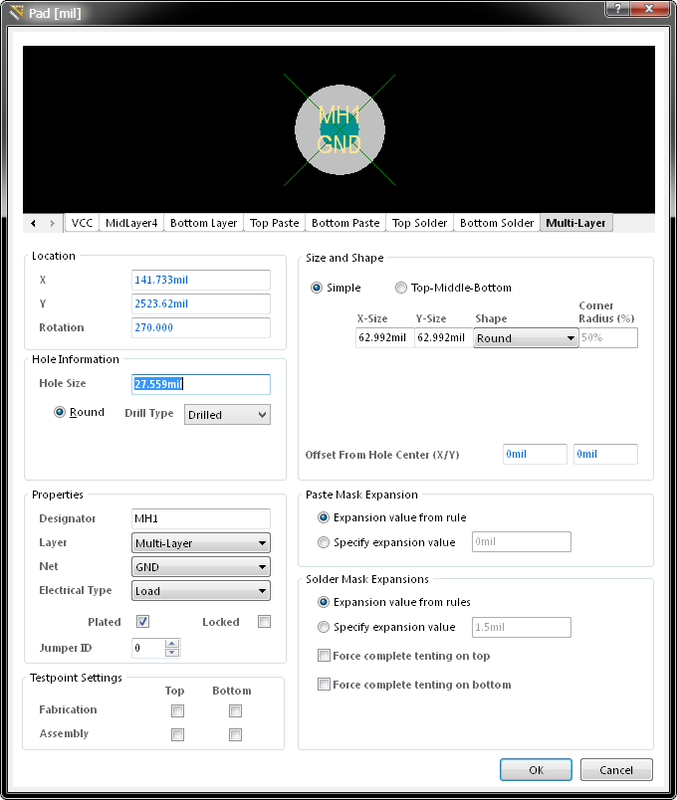 The PCB panel can be used to select display properties for 3D models. The cone icons represent different levels of transparency from 100% (hidden) down to 0% (solid) in increments of 25%. You can select multiple components and apply the same display controls to them at once using the Highlighted Models options. The selected cylinder model being set to 75% opacity. Multiple models can also be selected and changed in one step. The 3D Bodies Display Options controls (above) allow you to control the display of 3D bodies without having to modify the current view configuration. Display options set from the PCB panel are not saved as part of the view configuration. Multiple Model entries can be selected using standard Shift + click and Ctrl + Click features, providing full control over the 3D Model view and the base 3D elements that make up a component. Here, both a cylinder (set to 75% opacity) and a sphere (solid / 0% opacity) from a LED component are selected. Properties - access the corresponding properties dialog for the chosen object, from where you can view/modify the properties for that object. For example, with a component entry selected, using this command will access the associated Component dialog. Ctrl + click over a selected entry to deselect it. If the entry is the only one selected for that region, performing this action will clear the filter. The entries for the All Nets and All Components classes cannot be modified or deleted in the Object Class Explorer dialog. In sections of the panel where multiple columns of data exist, the data may be sorted by any column by clicking on the header for that column. Clicking once will sort in ascending order. Click again to sort by descending order.